For kiosks in public-facing environments with auto sign-in enabled, you should use a user account with least privilege, such as a local standard user account. Assigned access can be configured via Windows Management Instrumentation (WMI) or configuration service provider (CSP) to run its applications under a domain user or service account, rather than a local account. However, use of domain user or service accounts introduces risks that an attacker subverting the assigned access application might gain access to sensitive domain resources that have been inadvertently left accessible to any domain account. We recommend that customers proceed with caution when using domain accounts with assigned access, and consider the domain resources potentially exposed by the decision to do so. User account control (UAC) must be turned on to enable kiosk mode. Kiosk mode is not supported over a remote desktop connection. Your kiosk users must sign in on the physical device that is set up as a kiosk. \SetUpdateNotificationLevel with a value of 1, and \UpdateNotificationLevel with a value of 1 to hide all notifications except restart warnings, or value of 2 to hide all notifications, including restart warnings. Note: Installations can take from between 30 minutes and 2 hours, depending on the device, so you should schedule updates to occur when a block of 3-4 hours is available. To schedule the automatic update, configure Schedule Install Day, Schedule Install Time, and Schedule Install Week. Put device in Tablet mode. If you want users to be able to use the touch (on screen) keyboard, go to Settings > System > Tablet mode and choose On. Do not turn on this setting if users will not interact with the kiosk, such as for a digital sign. Hide Ease of access feature on the sign-in screen. 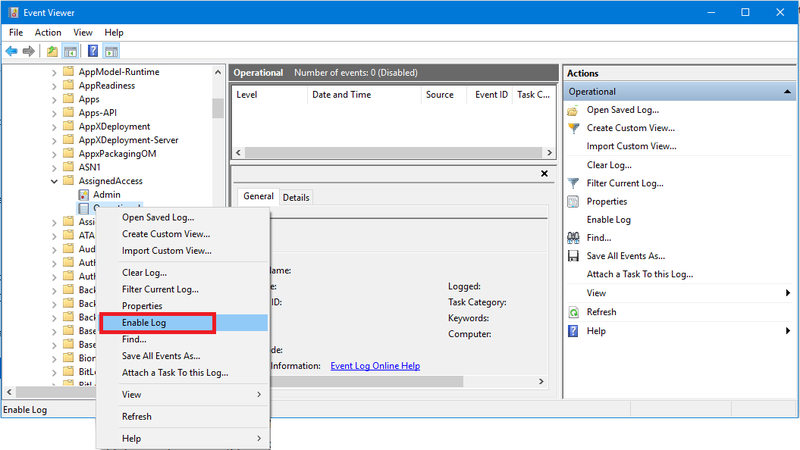 See how to disable the Ease of Access button in the registry. Disable the hardware power button. Go to Power Options > Choose what the power button does, change the setting to Do nothing, and then Save changes. Remove the power button from the sign-in screen. Go to Computer Configuration > Windows Settings > Security Settings > Local Policies >Security Options > Shutdown: Allow system to be shut down without having to log on and select Disabled. Disable the camera. Go to Settings > Privacy > Camera, and turn off Let apps use my camera. Turn off app notifications on the lock screen. Go to Group Policy Editor > Computer Configuration > Administrative Templates\System\Logon\Turn off app notifications on the lock screen. Disable removable media. Go to Group Policy Editor > Computer Configuration > Administrative Templates\System\Device Installation\Device Installation Restrictions. Review the policy settings available in Device Installation Restrictions for the settings applicable to your situation. NOTE: To prevent this policy from affecting a member of the Administrators group, in Device Installation Restrictions, enable Allow administrators to override Device Installation Restriction policies. Logs can help you troubleshoot issues kiosk issues. Logs about configuration and runtime issues can be obtained by enabling the Applications and Services Logs\Microsoft\Windows\AssignedAccess\Operational channel, which is disabled by default. In addition to the settings in the table, you may want to set up automatic logon for your kiosk device. When your kiosk device restarts, whether from an update or power outage, you can sign in the assigned access account manually or you can configure the device to sign in to the assigned access account automatically. Make sure that Group Policy settings applied to the device do not prevent automatic sign in. If you use the kiosk wizard in Windows Configuration Designer or XML in a provisioning package to configure your kiosk, you can set an account to sign in automatically in the wizard or XML. If you are not familiar with Registry Editor, learn how to modify the Windows registry. Set the values for the following keys. AutoAdminLogon: set value as 1. DefaultUserName: set value as the account that you want signed in. DefaultPassword: set value as the password for the account. If DefaultUserName and DefaultPassword aren't there, add them as New > String Value. DefaultDomainName: set value for domain, only for domain accounts. For local accounts, do not add this key. Close Registry Editor. The next time the computer restarts, the account will sign in automatically. You can also configure automatic sign-in using the Autologon tool from Sysinternals. The following table describes some features that have interoperability issues we recommend that you consider when running assigned access. Where applicable, the table notes which features are optional that you can configure for assigned access. When in assigned access, some key combinations are blocked for assigned access users. Alt+F4, Alt+Shift+TaB, Alt+Tab are not blocked by Assigned Access, it is recommended you use Keyboard Filter to block these key combinations. Ctrl+Alt+Delete is the key to break out of Assigned Access. If needed, you can use Keyboard Filter to configure a different key combination to break out of assigned access by setting BreakoutKeyScanCode as described in WEKF_Settings. Switch windows within the application currently open. Open the app that is assigned to this key, which on many Microsoft keyboards is Calculator. If Keyboard Filter is turned ON then some key combinations are blocked automatically without you having to explicitly block them. For more information, see the Keyboard Filter reference topic. Keyboard Filter is only available on Windows 10 Enterprise or Windows 10 Education. Customizations for the Power button complement assigned access, letting you implement features such as removing the power button from the Welcome screen. Removing the power button ensures the user cannot turn off the device when it is in assigned access. For more information on removing the power button or disabling the physical power button, see Custom Logon. UWFsettings apply to all users, including those with assigned access. For more information, see Unified Write Filter. Customizations for the Welcome screen let you personalize not only how the Welcome screen looks, but for how it functions. You can disable the power or language button, or remove all user interface elements. There are many options to make the Welcome screen your own. For more information, see Custom Logon. Customers sometimes use virtual machines (VMs) to test configurations before deploying those configurations to physical devices. If you use a VM to test your single-app kiosk configuration, you need to know how to connect to the VM properly. A single-app kiosk kiosk configuration runs an app above the lockscreen. It doesn't work when it's accessed remotely, which includes enhanced sessions in Hyper-V. When you connect to a VM configured as a single-app kiosk, you need a basic session rather than an enhanced session. In the following image, notice that Enhanced session is not selected in the View menu; that means it's a basic session. 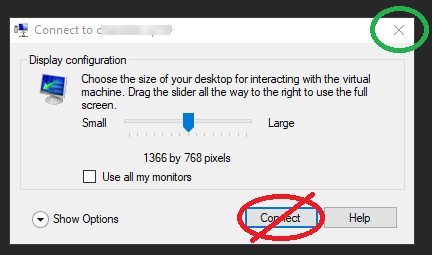 To connect to a VM in a basic session, do not select Connect in the connection dialog, as shown in the following image, but instead, select the X button in the upper-right corner to cancel the dialog.